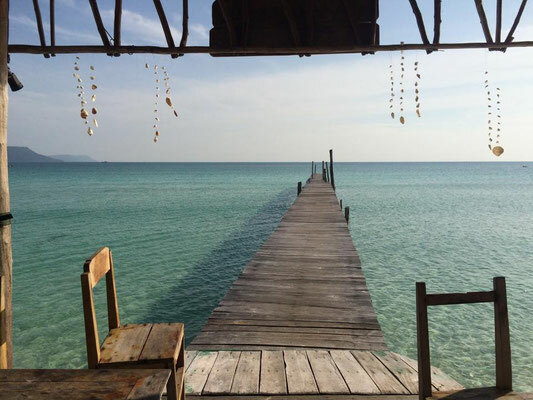 Koh Rong is the second largest island of Cambodia. Located about 25 kilometers off the Sihanoukville coast. This island is one of the most beautifull in this archipelago with 43 kilometers of beaches from white to beige sands, gently swaying palm and turguois blue water. The southeastern site of the island is the busiest part of the island with the most accomodition from dormitories to family sized beachside bungalows. But if you looking for a more quiet place, there are more secluded options located around the island. I am sure you will found your personal paradies ! You can visit Koh Rong Island on a day tour or stay in one of the bungalows. Koh Rong Sanleom is the next largest island in the Koh Rong archipelago. This island is a quieter, more secluded alternative to Koh Rong. The beaches on the eastern side are an eye-blinding white. Koh Russei or Bamboo Island is the closed Island to the mainland and easily visited on a day trip. There are no regular accommodiations on the island. The most tour operators bring there clients to the the golden sand beaches on the eastern side of the island. But if you want a more quiet place , it is only a short walk to the more secluded beach on the western side.